Coming soon: Boater’s Safety and Survival Skills classes. This 4-hour course covers firearms safety and defensive use of the handgun and meets Oregon CHL requirements. It will give you a better understanding of the handgun its safe handling and the law as it applies to its carriage and use in defending yourself. This 4-hour course covers firearms safety and defensive use of the handgun, and meets Utah CHL requirements. It will give you a better understanding of the handgun, its safe handling and the law as it applies to its carriage and use in defending yourself. This one-day class is the starting point for the Public Safety Training Center’s handgun-skills curriculum. It requires no prior handgun knowledge or experience. Understanding the principles of basic firearms safety is emphasized throughout PST 101 — in a classroom lecture and on the range. The fundamentals of marksmanship are a focus of the class, in both dry- and live-fire exercises. This intensive 2-day course (minimum 16 hours) is the starting point for realistic self-defense preparedness. If you keep or carry a handgun for defensive purposes, you need this training. 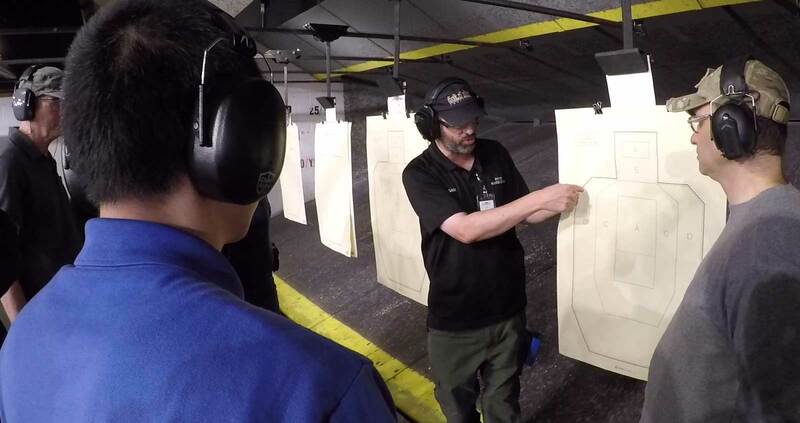 This intensive 2-day course (minimum 16 hours) continues the development of defensive handgun skills begun in PST 102 — and introduces new techniques. Focuses on the use of force decision making, which will help students with tools to deal with some defensive decisions. This course provides training in the use of back up guns (BUGs) for self-defense. BUGs are generally considered to be pistols or revolvers with barrels shorter than 4", typically carried in a pocket holster, or ankle holster carry mode. These guns are much slower to draw and harder to shoot than a larger handgun carried in a belt holster, but in many situations, a BUG is the only thing left to defend your life. This full-day class brings a full understanding of the concepts of firing, manipulating and operating a firearm in a low-light environment — with and without a flashlight. Part of being prepared for a self-defense situation is to be sure the people you spend time with know what they should do. Whether they are armed or not, you both need to know where to move so neither of you ends up in the line of fire. This class is designed to help you and your partner develop a plan of predictable commands and moves to keep you both safe, and at the same time maximize your opportunity to engage the threat. The Clackamas County Sheriff’s Office provides a Department of Public Safety Standards and Training (DPSST) Firearms Qualification Course for retired law-enforcement officers — pursuant to the Law Enforcement Officers’ Safety Act of 2004. Course covers working systems and safe operations of boats, Oregon boating laws, etiquette, and useful skills/techniques operating in and around the water. Course incorporates the latest science and teaches students to recognize and care for a variety of first aid emergencies such as burns, cuts, scrapes, sudden illnesses, head, neck, back injuries, heat and cold emergencies and how to respond to breathing and cardiac emergencies to help victims of any age. Review of lessons learned in MED 101. Participants will gain practical knowledge to plan appropriately, avoid common mistakes, use current & primitive technology, and gain foundational skills to survive being lost or stranded in Oregon wilderness. Provides participants with a variety of strategies, including some survival level fighting skills, designed to help defend against sexual assault attacks. Skills taught include multiple strikes to target areas, as well as escapes from choke holds, body grabs, and wrist grasps, and defense techniques from the ground. Class will involve combining strikes from the introductory class, drills that incorporate the student holding a pad, multiple attacker practice, weapons defense drills and other exercises that build on the skills learned in the introductory class. The intensity level of this class is stepped up a notch from the first class both physically and emotionally. This class is intended to solidify learning from basic will adding additional skills; can be take multiple times ongoing to build proficiency. Building on skills learned in basic and intermediate, this class will focus on weapons defense/disarmament and techniques to use common everyday objects as weapons.